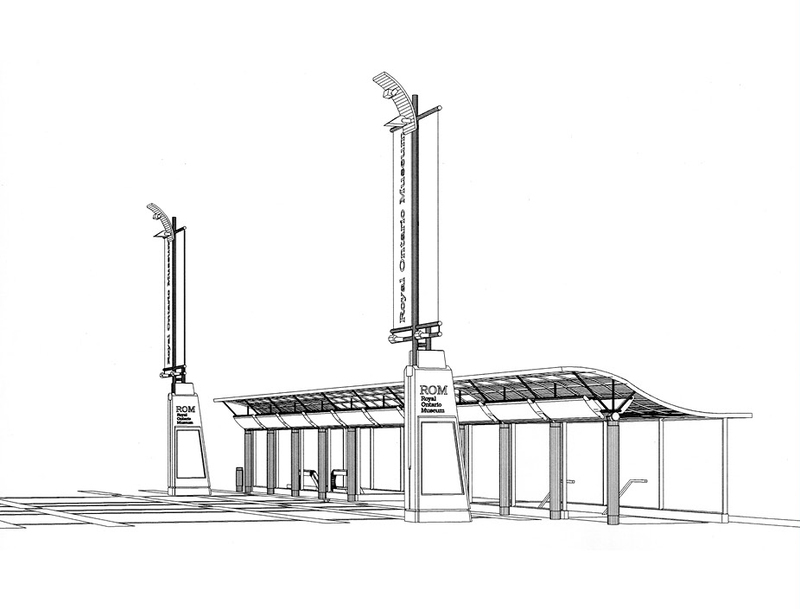 TTC: Museum Station Easier Access - Strasman Architects Inc. 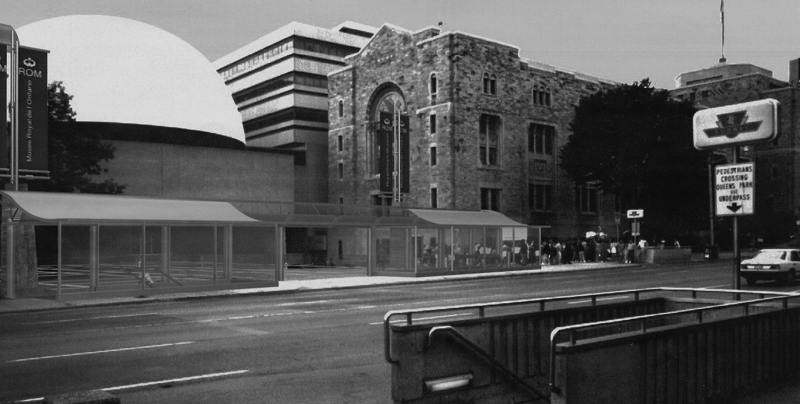 The Museum station project had an intensive involvement by other parties, in particular, Metro Transportation, City of Toronto Planning and Development Department, and the Royal Ontario Museum. The high urban design profile of the site and its relationships to the R.O.M. plaza made it the subject of great scrutiny, yet the integrity of the design remains intact. There are two existing stairwells on the west side of Queen’s Park which exit onto the sidewalk directly in front of the planetarium plaza just south of the R.O.M. After exploring various possibilities, it was decided to locate the new escalator between the two existing stairwells. 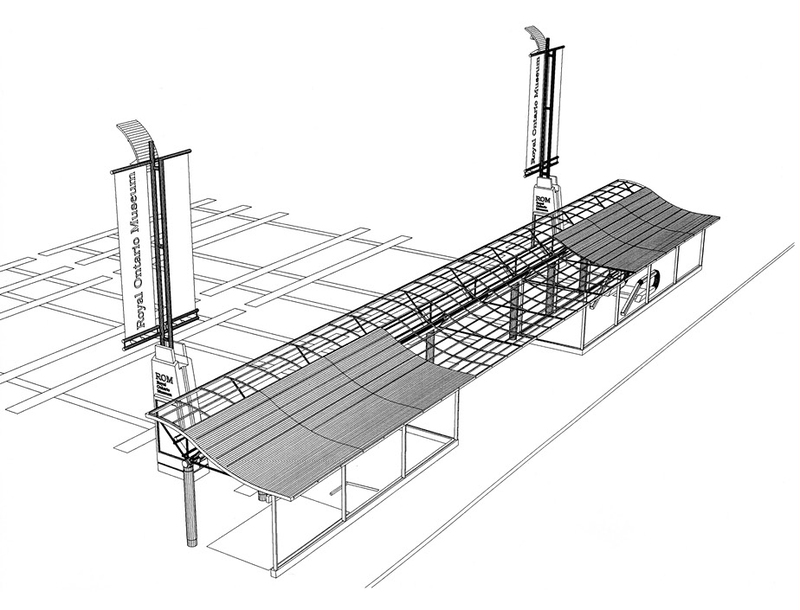 This location was found to be the most practical at the mezzanine level, but in addition at street level, the canopy could be placed in such a way as to directly address the plaza and provide a public shelter. In effect, the canopy structure completes the fourth side of the square. (The plaza was concurrently undergoing a refurbishment aimed at increasing the intensity of its use as a public place). The two banner/pylons shown on the plaza are not part of the TTC project.